The Library of Congress has selected Sealaska Heritage Institute’s Baby Raven Reads literacy program for its 2017 Best Practice Honoree award, making it one of only 15 programs in the world to receive the honor this year. 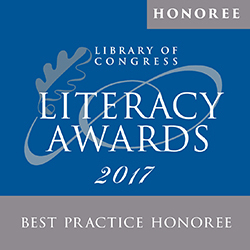 The Library of Congress Literacy Awards honor organizations that have made outstanding contributions to increasing literacy in the United States or abroad and encourage the continuing development of innovative methods for promoting literacy and the wide dissemination of the most effective practices. The program was founded by philanthropist David M. Rubenstein in 2013. In an award letter, the Library of Congress noted SHI’s success in applying research-validated practices to promote literacy through its Baby Raven Reads program. The letter also said that Baby Raven Reads “serves as a valuable model for other organizations seeking to create evidence-based literacy programs.” The award comes with a $5,000 prize, which will be given at a ceremony at the Library of Congress in Washington, D.C., this fall. Baby Raven Reads is a culturally-based program that promotes early literacy, language development and school readiness of Alaska Native children. The program focuses on children age 5 and under because research indicates that children who are fluent readers by the end of third grade are likely to do well in school and go on to higher education. Through the program, SHI promotes school readiness and early literacy; incorporates family events; and publishes culturally-relevant children’s books. SHI since 2016 has published 11 Baby Raven books that reflect the Native worldview and today unveiled four additional books, which will be released on Friday, Sept. 8, at a book signing at the Walter Soboleff Building in Juneau. An additional three books will be published later this fall, bringing the total for the three-year program to 20. The release of the books is groundbreaking because so few culturally-relevant children’s books from Southeast Alaska exist that are not tailored for the commercial market. And, research has shown that Native students do better academically when their cultures are incorporated into learning materials and classes. The Library of Congress gives the award only to programs that have proven to be innovative, sustainable, replicable and evidence-based. They must also have measurable results. Since its inception, more than 190 Alaska Native families have enrolled, and a study by the McDowell Group in 2016 found, among other things, that 68 percent of Baby Raven Reads respondents observed a significant improvement in vocabulary and 18 percent observed some improvement. The study also found that, on average, children in the Baby Raven Reads program were read to 160 minutes in a typical week compared to children not in the program who were read to an average of 120 minutes. Raven Reading: A Culturally Responsive Kindergarten Readiness Program is funded by an Alaska Native Education Program grant from the U.S. Department of Education: CFDA # 84.356A, PR# S356A140060. The Library of Congress is the world’s largest library, offering access to the creative record of the United States—and extensive materials from around the world—both on site and online. It is the main research arm of the U.S. Congress and the home of the U.S. Copyright Office.